Over the past few days, PETA has quite vocally condemned the death of Eight Belles at the Kentucky Derby. There is a much darker side to this tale. These supposedly defenseless animals do not need your sympathy. They are quite capable of are taking matters into their own hooves. 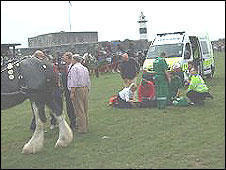 At a heavy horse show in Hampshire, England, a horse bolted while parading and rampaged through a crowd of people, doubtlessly seeking revenge for Eight Belles’ death. Six people total were injured, including a pregnant woman who went into shock and two bystanders who suffered broken ankles and were euthanized taken to the hospital. For those keeping score, that’s 2 broken ankles for humans, and 2 broken ankles for horses in this week of bloodshed. When will this senseless cycle of violence end? And which side will the centaurs be on?